Is there anything more feminine than a ruffle? This season, its all about tiered ruffle dresses. A look half 1920s’ flapper, half Grecian goddess, it features luscious wedding cake-like horizontal layers. So lovely and ethereal. Check out my top ruffled picks. 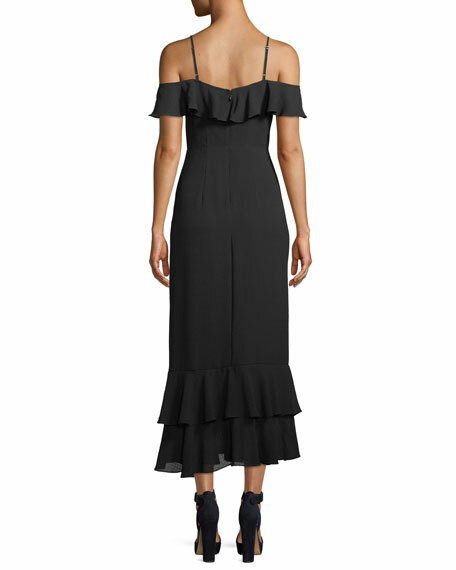 Blow-your-budget ruffles, the Filipa Crepe Maxi Dress from Borgo de Nor. $1,165.00. http://www.selfridges.com. 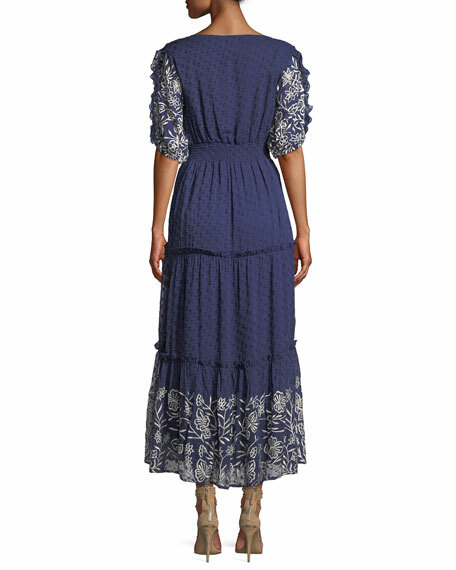 A less pricey but no less fetching ruffled gown is this navy number from Whistles. $350.00. http://www.selfridges.com. Here is one that could do double-duty as a wedding dress. 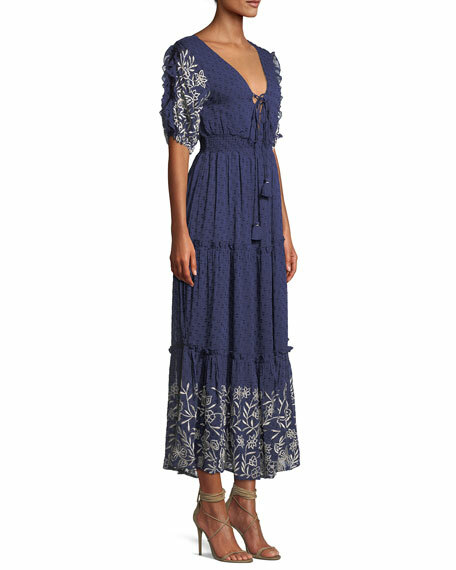 Also from Whistles, the Isla tiered gown features lace. $750.00. A lady in a red dress always commands the room. This vibrant ruffled gown is from Betsy & Adam. It also comes in black. $229.00. http://www.macys.com. Another high-end version, the Eve Tiered Silk-Satin Dress from Deitas reminds me of something a fashionable lady in the Victorian Age would wear. I find it so chic and elegant. $1,165.00. http://www.selfridges.com. This whimsical embroidered chiffon gown from Needle and Thread is my idea of ruffle heaven. $410.00. http://www.selfridges.com. This delicate floral dress is from Rachel Roy. $129.00. http://www.macys.com. Donna Mizani’s Siren Dress features cold shoulders–which, by the way, is a very flattering look for all sizes and shapes–and …, of course, frilly ruffles. $230.00. http://www.neiman.marcus. 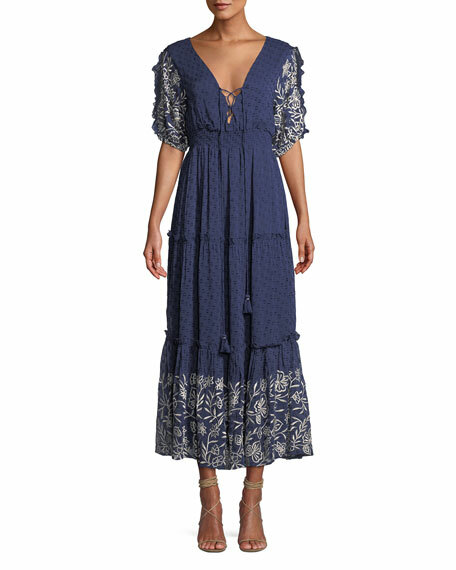 I love the peasant Bohemian vibe of this more casual ruffled dress from MISA of Los Angeles. On sale for $329.00. http://www.neimanmarcus.com. 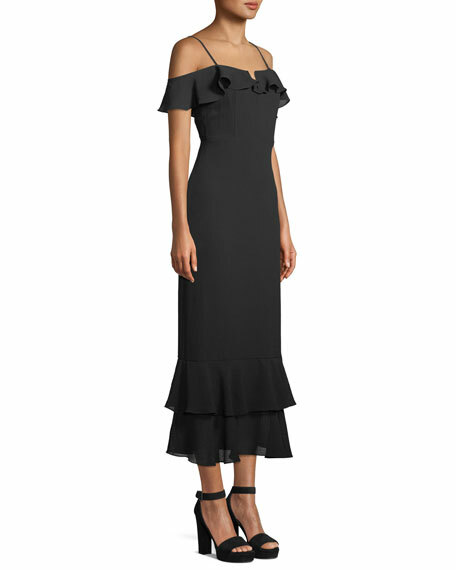 Here is an asymmetrical ruffle dress from Mango. This is definitely more casual thanks to its raw edges and industrial print. It’s currently on sale for $99.00. shop.mango.com. This one also comes in black.